On your next vacation to Kerala’s port city, Kochi, hit up Sea Hut Homestay for beach vibes, hammocks, and a weekend of kicking back and chilling. If Kochi is calling, it’s definitely the beach and the historic Fort Kochi that must be calling you. The beachside isn’t commercial like the ones on Goa and you can be a beach bum as much as you please without worrying about the crowd. Then there’s Fort Kochi which gives you a peek into the colonial era with Dutch architecture and historic locales. With both these locales a hop, skip, and jump from Sea Hut Homestay, it’s the ideal place to check in. Just five minutes from Kochi Beach, the Kerala-style homestay is quaint and away from the bustling city side. It’s got that real Kerala village vibes with the coconut and mango trees surrounding it. 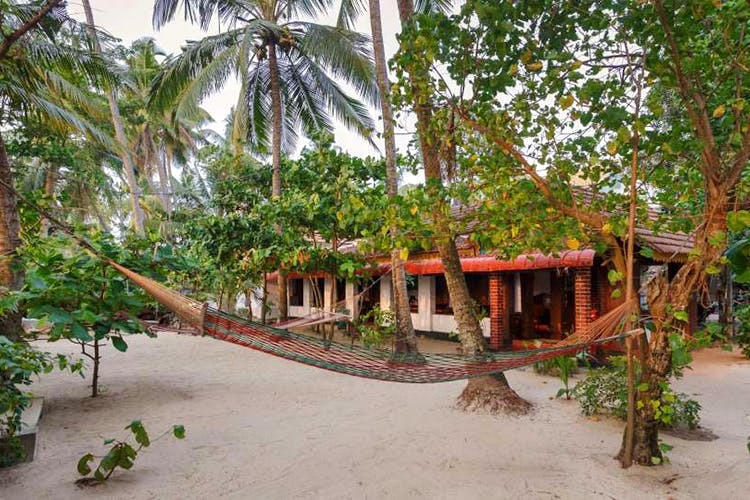 How idyllic it looks with the beach in its sandy backyard and hammocks for you to lounge about. Rooms come with WiFi, four-poster beds, and you can pick between an AC suite or a standard room. In summers, we suggest the AC suite with a small balcony overlooking the beach. Kathakali performances and houseboat rides can be arranged on request but we say skip that and head to Fort Kochi and hit up the streets. If walking isn’t your thing, a scooter can be arranged by the hosts. Hit up Willingdon Island which is on the other side of the property. Do not forget to hit up Jew Street too. In fact, check out our 12-hour guide to spending the day at Fort Kochi here. We suggest you carry a few books because there’s plenty of nooks around the property for you to cosy up and read. Oh, do say hello to the resident dog Tinku and a cat who are always within ruffling distance. Food is typical Kerala fare that needs to be requested in advance as the hosts prepare everything fresh.